For nearly 25 years, Jack & Benny’s has served as a University District staple. The greasy spoon and its all-day-breakfast menu draws diners from Ohio State University and beyond. The name Jack & Benny’s goes back even further. In 1954, Jack Sher and Benny Klein opened Columbus’ first Jack & Benny’s diner downtown, at Broad and High streets. Klein then opened a second restaurant at the intersection, Benny Klein’s Charcoal Steak House, three years later. A tunnel — plus a continuous conveyor belt washing dishes — connected the two restaurants. Enter Geno Garcia Sr. Sher and Klein hired Garcia after he came to Columbus in 1970, affording Garcia the opportunity to learn the ins and outs of the restaurant business. So when Garcia opened his own restaurant in the Old North area of campus in 1994, he named his diner Jack & Benny’s, in honor of the two restauranteurs and their namesake eatery. Garcia has since retired and passed the diner on to his son and daughter-in-law, who’ve opened two more Jack & Benny’s locations in the last five years — one at the Ohio State Airport and another in nearly the same downtown spot where Sher and Klein ran their restaurant. But back to the ’50s. Five years after Columbus’ first Jack & Benny’s opened downtown, the black-and-white above was taken at the corner of Hudson and High streets — the future home of Garcia’s Jack & Benny’s. In 1959, people could still find food at this intersection, though it was more sweet treats than meals. A convenience store, Hudson-High Sundries, sold sodas, “hand-packed ice cream” and more in this space. 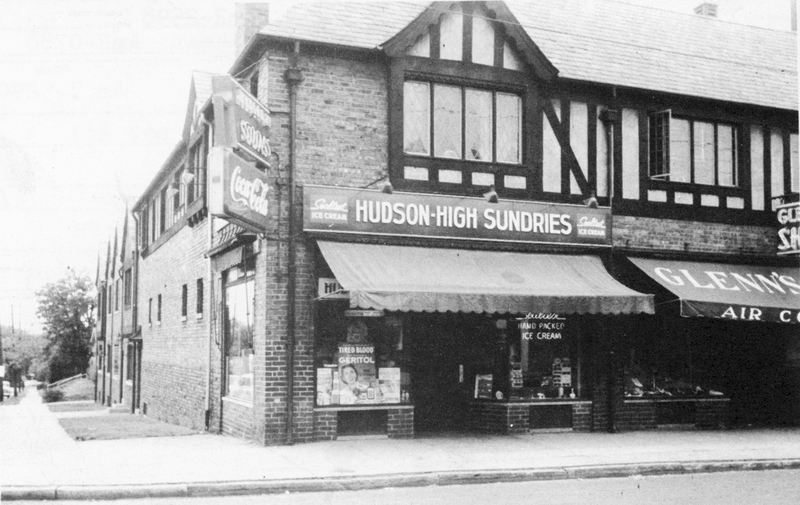 Hudson-High Sundries is long gone, but the structure it once called home remains. 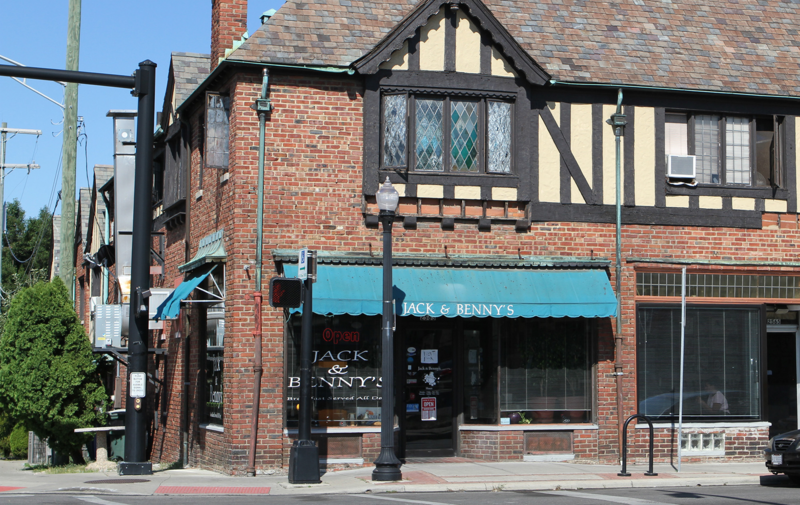 As the portion of High Street that runs through campus receives a commercial makeover, Jack & Benny’s and the Old English-style structure it occupies stand as a reminder of the seasons Columbus has seen. Next time, explore Columbus’ history through photographs. Watch at 8:30pm Thursday, July 19 and noon Sunday, July 22 on WOSU TV! This entry was posted	on Thursday, July 19th, 2018 at 10:31 am	and is filed under Past and Present, Photograph. You can follow any responses to this entry through the RSS 2.0 feed. Both comments and pings are currently closed.